The USS Iowa when launched was designated the "World's Greatest Naval Ship" due to her large guns, accurate fire control systems, heavy armor, and fast speeds. 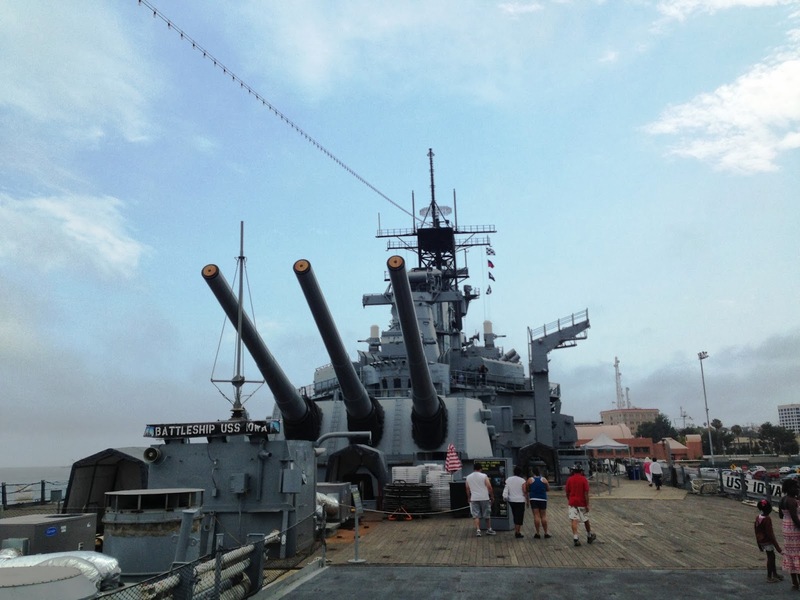 A visit to the USS Iowa which is now located permanently in the Port of Los Angeles is a must do because it offers a great historical learning experience from World War II all the way to the present day. For more pictures of the USS Iowa make sure to check out our Facebook Page. 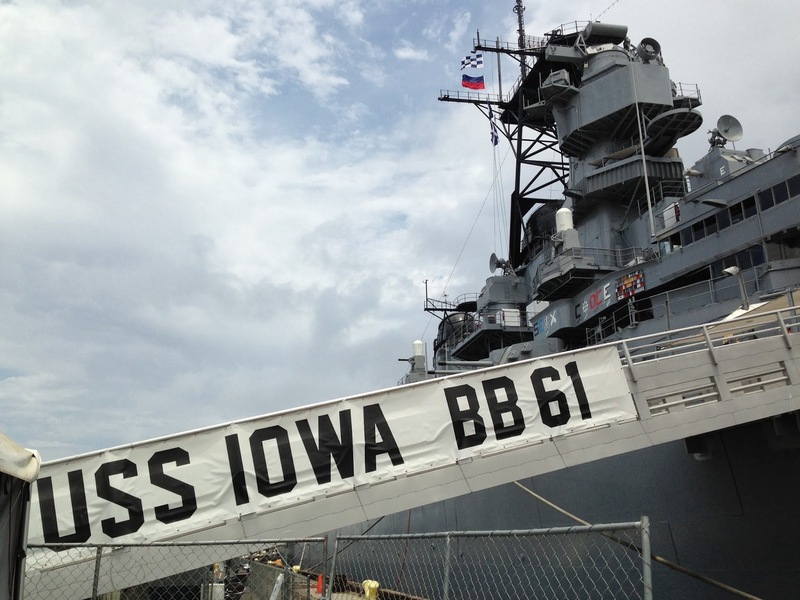 The USS Iowa is open every day, except Thanksgiving and Christmas and is open from 1000 to 1700 (10:00 AM to 5:00 PM) with the last ticket sold at 1600 hours (4:00 PM). There is a charge for parking, when we went it was $1.00 per hour. Tickets to board the USS Iowa for adults presently cost $18 per person and can be purchased Here. Also you might want to check out website like Groupon or other internet deal websites because you can likely find coupons and other discounts. We used a Groupon which was buy one get one free. 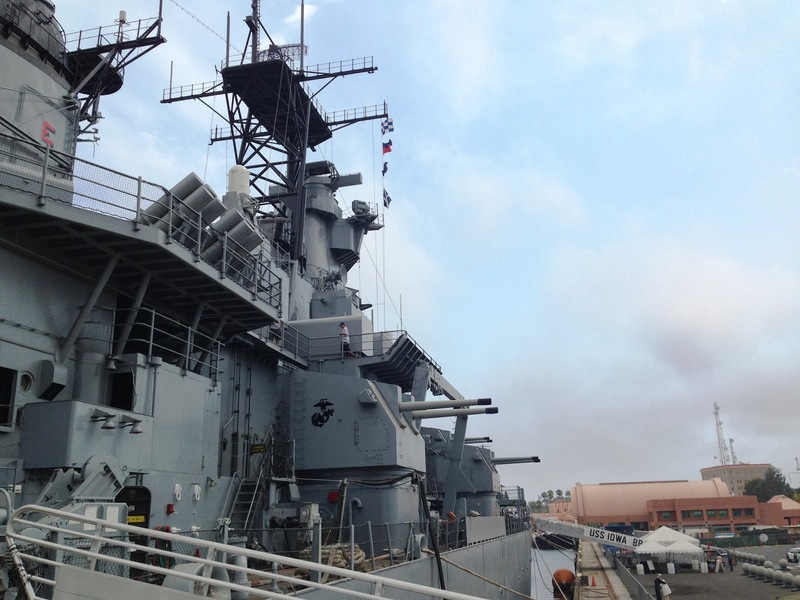 Description of Trail: The tour of the USS Iowa traverses much of the entire ship, travels up and down stairs and provides a great overview of the entire battleship. Obviously, this hike is a little different than the others on our hiking blog. It is recommended that when you visit the USS Iowa that you wear appropriate shoes, ie no high heels or un-sturdy shoes, it is important to keep in mind the ship was built for war and not to be a museum. The stairs can be tricky if you are not wearing proper shoes. 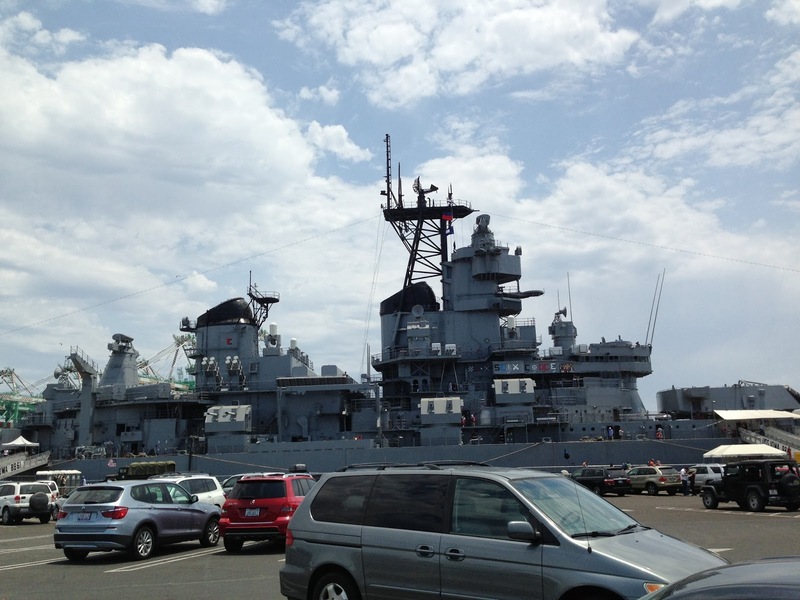 Additionally the Battleship is not currently ADA Accessible. They are attempting to change that, but it will take a while. Lastly you shouldn't bring strollers or walkers aboard the ship. 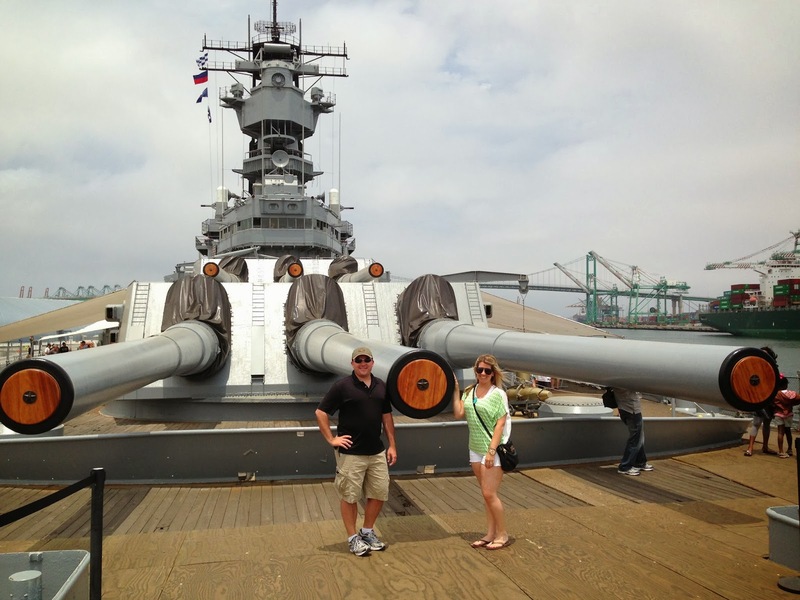 Further Thoughts: Ashley and I really enjoyed our visit to the USS Iowa. 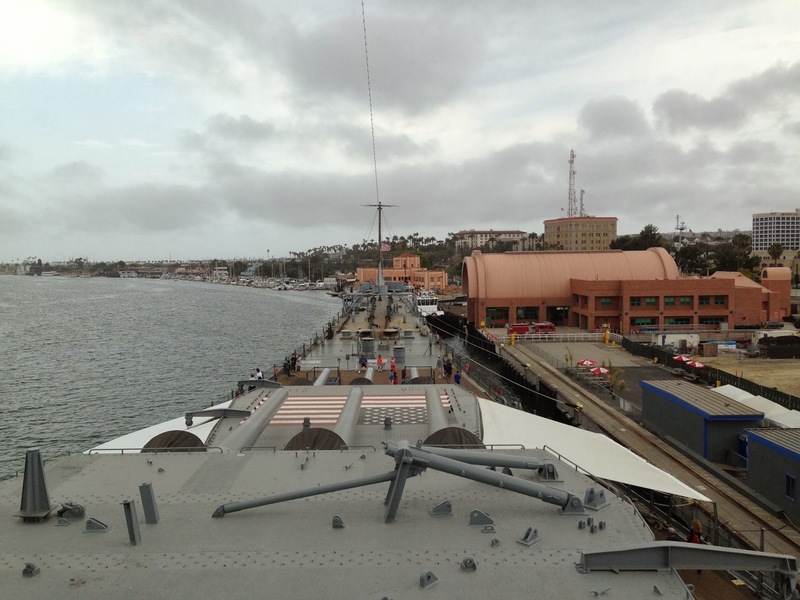 It was amazing to see a ship with such a storied history and a long line of distinguished service. There were volunteers on the ship that were very helpful and provided informative talks with visitors. We also met a a couple of World War II veterans that were volunteers informing visitors about the ship as well. We enjoyed seeing the ships main 16 inch guns which were impressive to see. The main guns on the USS Iowa each fire a 2,700 lb (1,200 kg) armor-piercing shell some 20 nmi (23 mi; 37 km). They also have a neat gift shop on the USS Iowa which is definitely worth a visit as well. Ashley and I made sure to post this post on December 7 of this year in memory to those lost at Pearl Harbor in 1941. This post is done on the 72 anniversary of that tragic day and is dedicated to those lost that day. USS Iowa (BB-61) was the lead ship of her class of battleship and the fourth in the United States Navy to be named in honor of the 29th state. Owing to the cancellation of the Montana-class battleships, Iowa is the last lead ship of any class of United States battleships and was the only ship of her class to have served in the Atlantic Ocean during World War II. During her more than 50 years in service, Iowa has welcomed and escorted our nation’s Commander in Chief on many occasions. No other battleship in our nation’s history has been host to more U.S. Presidents than the USS Iowa. The ship has hosted President Franklin Delano Roosevelt, President Ronald Reagan and First Lady Nancy Reagan, and President George H.W. Bush. 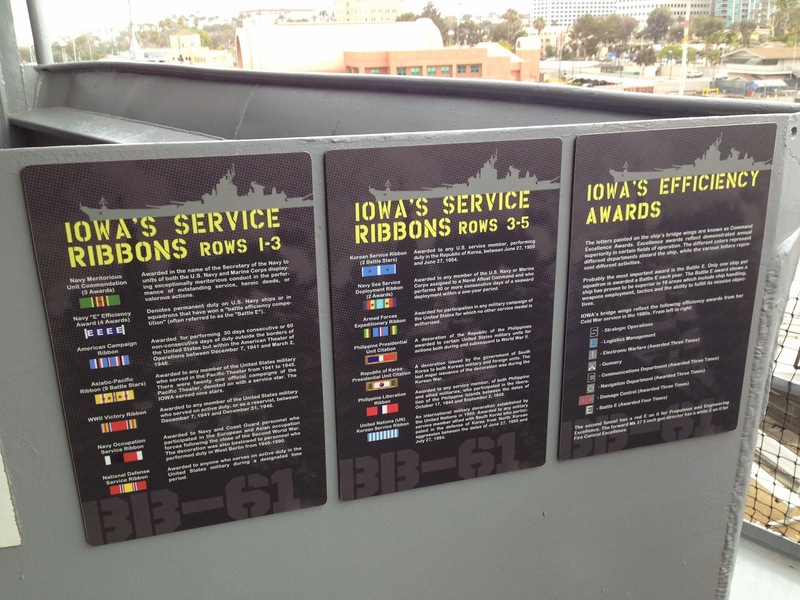 For more statistics on the USS Iowa click Here. To learn more about the non-profit that helps aide in the preservation of the USS Iowa, click Here. Ashley and I love these type of historical adventures and would highly recommend it to others! Another fun historical adventure in Southern California is the USS Midway in San Diego. Rating: Elevation Gain: minimal. (Easy), Distance: < 1 Mile Roundtrip (Easy). Time to Complete Hike: 1 hours.